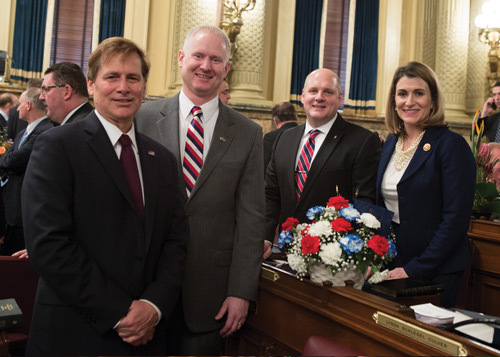 On Tuesday, Jan. 6, members of the state House and Senate took the oath of office, marking the start of the 199th Session of the Pennsylvania General Assembly. Pictured, from left, are Rep. Jack Rader Jr. (R-Monroe), Rep. David Parker (R-Monroe), Rep. Doyle Heffley (R-Carbon) and Rep. Rosemary M. Brown (R-Monroe/Pike). The swearing-in ceremony was the first for Parker and Rader, as they were elected to office in November 2014. Heffley and Brown were both elected to office in 2010 and are now serving their third terms.